Musicians, programmers, designers, composers, hardware tinkerers, and fans all in one place? Sounds like the Nashville Music Hackathon. Music has always been driven by technology, whether we’re talking about 8-tracks or autotune. The Nashville Music Hackathon is a celebration of the relationship between technology and music. It’s an opportunity for professionals in each industry to work together, explore problems, and create solutions. If you’re unfamiliar with the hackathon, here are seven things you should know. Yep. You read that right. 100% free. All day. But tickets are limited, so you should register right now. 2. The day will open with a few short presentations. To get everyone in the right mindset, we’re going to start with some educational presentations. 3. There will be an open mic. Hacking starts with an open mic. That way, participants can share what they’ll be working on. 4. Hacking will happen in groups. After participants share what they’re working on, there will be a short period of time in which you’ll be able to network with other participants and form groups to participate with. 5. The day will end with presentations about the projects. At the end of the day, each group will have the opportunity to present what they created. 7. It’s at a real cool spot, too. And here’s a bonus fact. Nashville Music Hackathon is organized by volunteers, led by Corey Rice, web/mobile developer at ClearSummit. The inaugural Southeast PHP Conference starts in just one week. Organized by members of the grassroots PHP community in Nashville, the conference will run from 9 am to 5 pm on August 16-17 at Hotel Preston. Drawing participants from across the country, the Southeast PHP will feature over 30 speakers and kicks off with Cal Evans’ opening keynote: Apple, Butter, Darmok: A communications primer for Developers. Each day’s afternoon keynote will be followed by an After Party, sponsored by Concrete 5 on Thursday and by Twilio on Friday. During the day, attendees will have the opportunity to choose between 3 sessions for each hour (excluding keynotes). Topics range from PHP development to self-improvement, mental health, and diversity. A limited number of tickets remain. Register now before they sell out. Southeast PHP is organized by volunteers, led by Marcus Fulbright, software engineer at Built Technologies, and Matt Trask, software developer at Bernard Health. A new week-long tech event that culminates in a 48-hour community hackathon will substitute for BarCamp Nashville this October. Nash Hack Weekathon will be held October 13-21, 2018. It’s a new event created by the organizing team behind BarCamp Nashville. Since 2007, BarCamp Nashville has been an important part of Nashville’s tech ecosystem. This new event is designed to be a fresh way to connect to the grassroots tech community in Middle Tennessee. Although BCN will be in hiatus this year, Nash Hack Weekathon offers an opportunity for developers, designers, product managers, and marketers, to stretch their current skills or try out something new. The event will begin with a pitch competition, resulting in the selection of several featured teams. During the weekday evenings leading up to the hackathon, these teams will receive consultation from experts in the local tech community and meetup groups, with topics ranging from user feedback, UI/UX design, agile planning, and more to improve their project ideas. At the end of the week, the 48-hour hackathon will kick off; featured teams will pitch their updated project ideas, recruit team members, and start building. At the end of the hackathon, the featured teams will present their projects for prizes. For those who are not a part of a featured team, there are still plenty of ways to participate in the event. The weeknight meetups are open to anyone interested in learning more about the designated topic. Additionally, all are welcome to create their own teams to participate in the hackathon, or simply come and work on a project of their own. Everyone is invited to demo their work in a science-fair style event at the conclusion of the hackathon. Learn more about Nash Hack Weekathon, Nashville’s hackathon, at nashhackweekathon.org or ping one of the organizers in the #hackathons channel on NashDev Slack. Sign on to help by emailing volunteer at nashhackweekathon.org. Nash Hack Weekathon is organized by volunteers, led by planning team chair Jesse Page, VR developer and sound designer at BlackBox Realities, and is backed by TechFed Nashville. 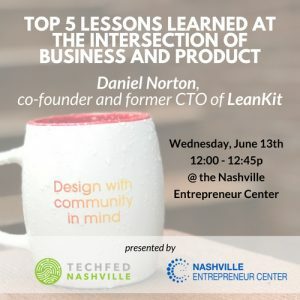 TechFed Nashville, in partnership with the Nashville Entrepreneur Center, will present a monthly Lunch & Learn Series designed to connect tech startups with experts in the local product development community. The Lunch & Learns will feature leaders and doers in Nashville’s business, entrepreneurial, and tech ecosystem. Whether you are a software developer, designer, product manager, marketer, entrepreneur, or business leader, these seminars are designed to help you gain a deeper understanding of the best ways to design technical solutions for challenging business needs. The first Lunch & Learn seminar, “Top Five Lessons Learned: A Career at the Intersection of Business and Product,” will be held at 12 p.m. Wednesday, June 13, at the Nashville Entrepreneur Center. The presenter will be Daniel Norton, co-founder and former CTO of LeanKit. An accomplished software developer, technologist, and business leader, Daniel has a unique perspective and boundless enthusiasm to share from his experience. He is currently pursuing an MBA at MIT’s Sloan School of Business. Lunch & Learns are free and open to all members of the Nashville business and tech community. You do not need to be a member of the Nashville Entrepreneur Center to participate. Doors will open at 11:30 am at the Entrepreneur Center. The program will begin at 12:00 pm, and end promptly at 12:45 pm. Parking is FREE with validation. A light lunch will be provided, courtesy of sponsors for each seminar. Registration is FREE, but seats are limited. The Lunch & Learn Series is organized by TechFed Speakers, an initiative of TechFed Nashville which helps connect organizations and events looking for presenters with a curated list of experienced speakers from the Middle Tennessee grassroots tech community. Additional Lunch & Learns are planned for August through November. Last held in 2013, ProductCamp Nashville will return on Saturday, September 16, at Redpepper. The one-day event focuses on best practices and lessons learned related to launching, growing and evolving successful products. Participants will have the opportunity to teach, learn from and network with hundreds of fellow product professionals at all levels and across all industries. 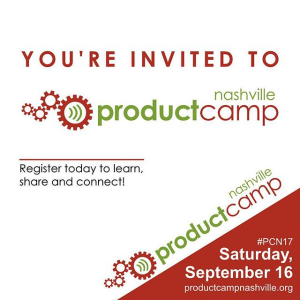 ProductCamp Nashville’s “unconference” format means that anyone can be a speaker. Speakers propose session topics in advance, and on the morning of the event, participants vote on the final schedule. Sessions range from presentations to workshops to roundtable discussions. Registration is FREE, but tickets are limited. ProductCamp Nashville is organized by volunteers, led by planning team chair Chris Boyd, VP of Product at Built Technologies, and is backed by TechFed Nashville. Stakeholders from area civic, nonprofit and governmental agencies will present opportunities to improve lives at the Nashville Day of Civic Hacking on Saturday, September 23, at the Nashville Software School. 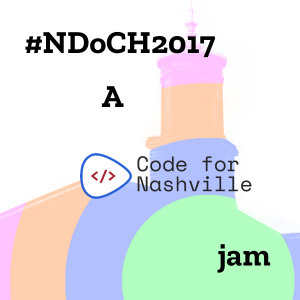 Organized by Code for Nashville in conjunction with the National Day of Civic Hacking, the event is part of a nationwide hackathon orchestrated in cities across the U.S. to provide opportunities to work together to improve society. The full day of critical thinking, problem solving, designing and coding begins with pitching of project ideas, followed by teams forming around preferred projects. The event is open to both novices and experts and is designed for collaboration among technologists, designers, developers, and operators in civic, nonprofit, and governmental spaces. Registration is FREE and includes lunch. Nashville Day of Civic Hacking is organized by Nick Lorenson, application engineer at HCA.